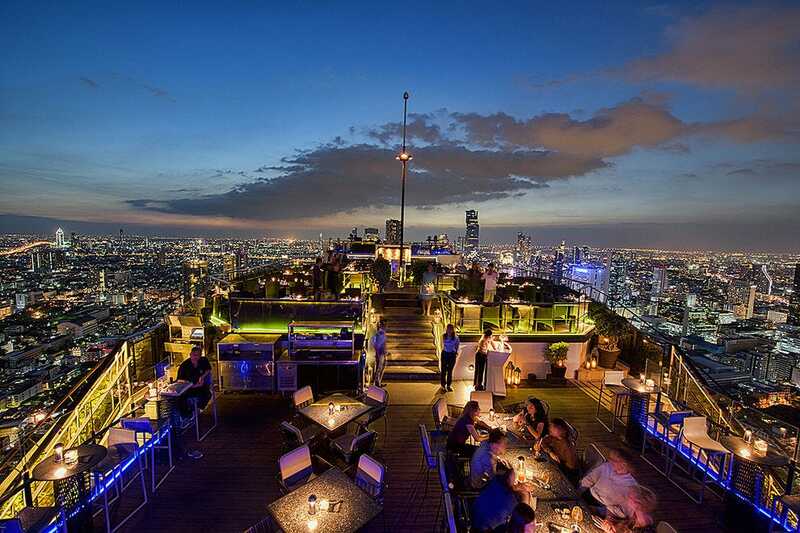 Not only do Bangkok's sky-high rooftop bars offer a welcome respite from the heat and traffic of the streets below, they are tourist-worthy attractions in and of themselves, as the views from the rooftops are the best in the city, especially as the sun goes down and the neon comes on, and an incredible cityscape and sea of highrises reveal themselves. 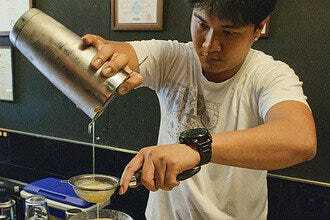 Oh, and you'll also have some of the best mixed drinks you've ever had anywhere, as a growing number of acclaimed mixologists front the Bangkok nightlife scene these days. 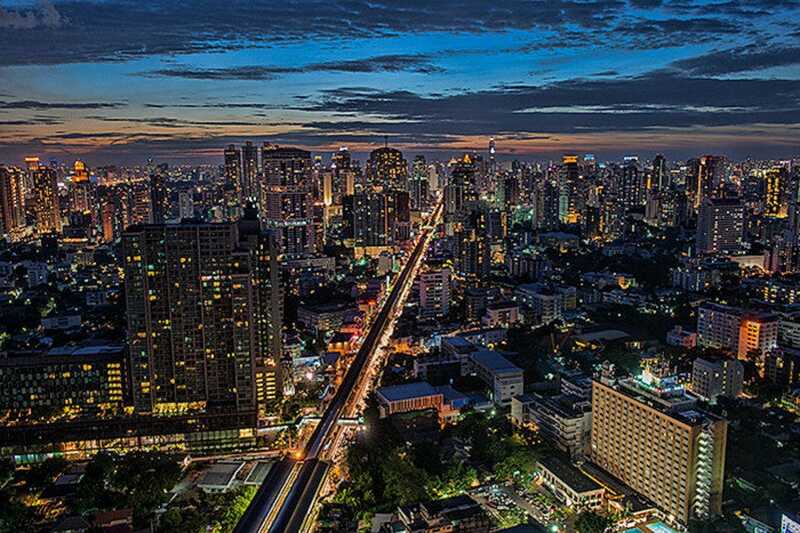 Many of the best roof bars are concentrated around Silom and Sathorn roads, in the heart of the business district and tallest buildings. 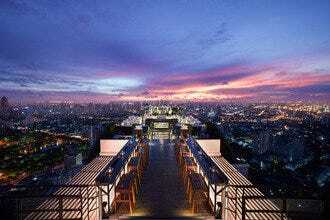 The Lebua State Tower Hotel in fact has three of the best rooftop abodes in town. Come drink a Hangovertini, made famous by the Hollywood film shot on location here at either the Sky Bar or Distil, or head to the new Lebua No. 3, a caviar and vodka bar set high above the crowds. 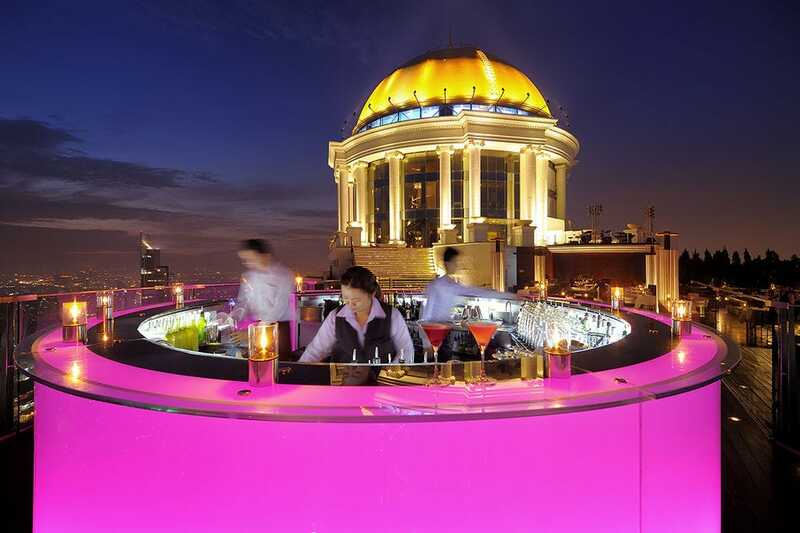 Nearby, the Moon Bar has one of the city's most dazzling 360 panoramas, perched way up on the top of the Banyan Tree. Also in the neighborhood is Park Society, with the best view of Lumphini Park, and further down the road, the somewhat hidden Zoom Sky Bar. 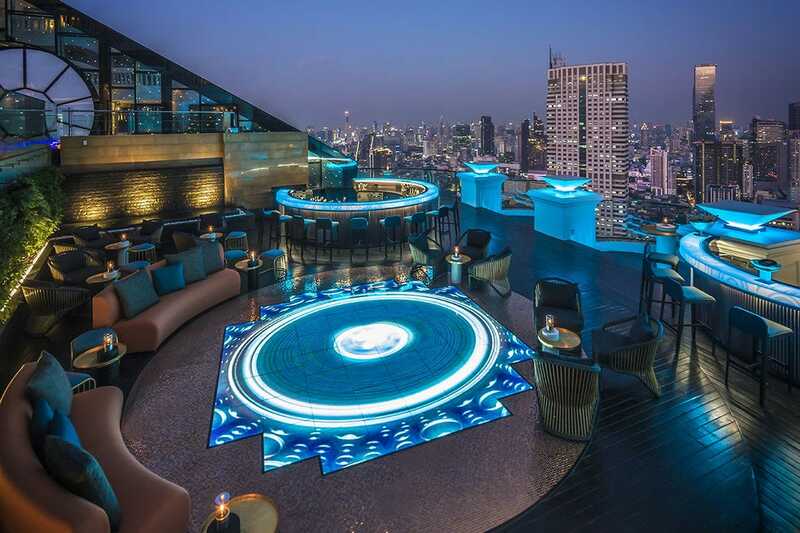 For Bangkok's highest champagne bar, CRU Champagne Bar on the roof of the Centara Grand combines limited edition pink champagne with fabulous sunset views. Speaking of sunsets, while The Roof sala rattanakosin might not be in a highrise, it does sit right overlooking the Chao Phraya River and takes in the city's best view of Wat Arun, and is absolutely perfect for a cold one at sunset. 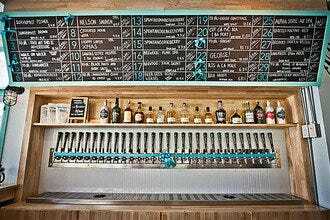 You'll never go thirsty up above the crowds here. With a wonderful location on top of one of Bangkok's tallest buildings and right next to the river, this bar is a great spot to sip a few drinks. It's the view and cooling breezes offering a welcome respite from the city's heat traffic that make the place, but the Sky Bar has also been named by numerous publications around the globe as one of the top rooftop bars in the world, and it really is a magical place to watch the lights of city come on as night falls. Suspended on a precipice some 250 metres up in the air, hordes of visitors head up here for sunset, many coming to sample a Hangovertini, the signature drink of the bar made famous when the Hollywood blockbuster Hangover II had several scenes shot up here. 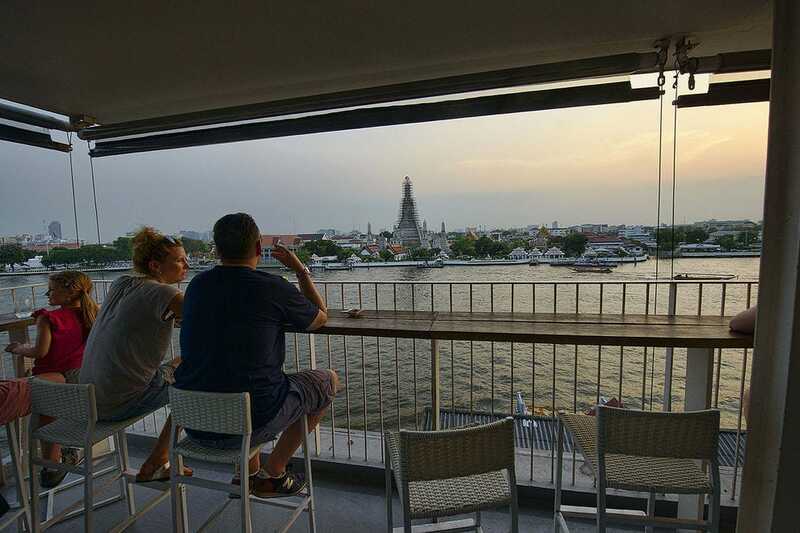 sala rattanakosin Bangkok hotel's Roof bar offers a birds-eye view of iconic Wat Arun, the Temple of Dawn, directly across the Chao Phraya River. 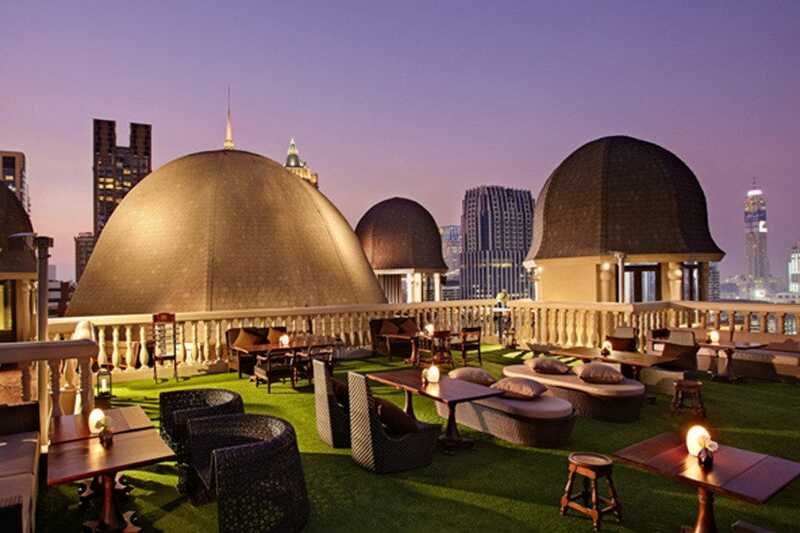 The intimate rooftop bar features both a covered and open-air area, and is the perfect place to unwind from the busy Wat Pho and Grand Palace area, which are just adjacent. From the highest perch in this neighborhood, you can take in not only Wat Arun at its most photogenic, but also watch the sun go down over the river, and there is even a back side view of all of Wat Pho, bathed in glowing gold as the sun sets. Enjoy an aptly named River cocktail creation, made with Absolut vodka and Blue Curacao, peach snap, mango and pineapple juice and passion fruit, or a Bangkok Sour, made with Mekhong Thai Whisky, Cointreau, Lime Juice, Pineapple juice and grenadine, along with a selection of beer, mocktails, and smoothies. Once the sun goes down, Wat Arun gets lit up with golden lighting, and you can head downstairs to the hotel's restaurant, sala rattanakosin bar and eatery, to continue a romantic night out. 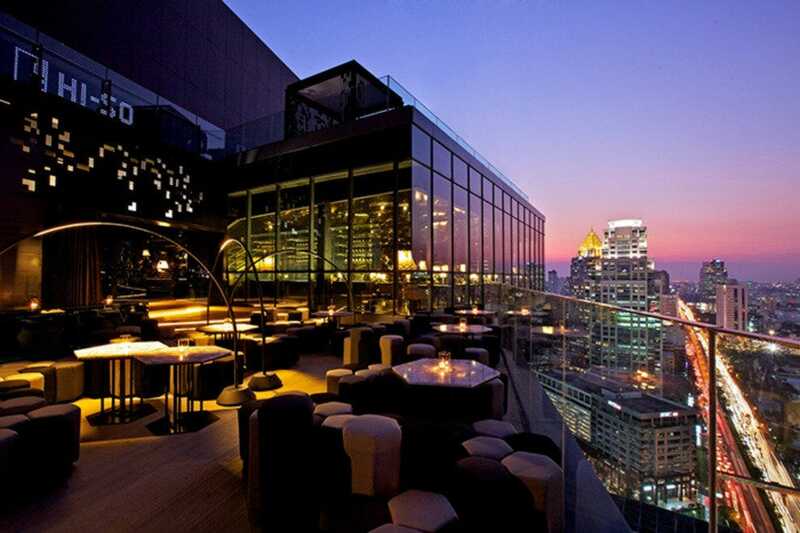 Octave Rooftop Lounge and Bar tops the sky high bar scene along Sukhumvit. While most of the airborne bars with views tend to be concentrated around Silom Road and the Chao Phraya River, Octave sits towering above Thong Lor and Sukhumvit Road, and the views from the 45th floor are absolutely spectacular, giving the feeling of being in a helicopter, as there is nothing around to impede the 360 degree panorama. In addition to the marvellous views, the three level bar and lounge also makes outstanding cocktails, as the in-house mixologist has signature drinks such as the Bangkok 57 (saffron infused vodka with champagne!) and the Bloom Over the Roof (red berries tea infused vodka mixed with mint leaf and elderflower syrup) to keep customers sated. There are also top wines available, along with some tapas style nibbles to go with the sublime surroundings. 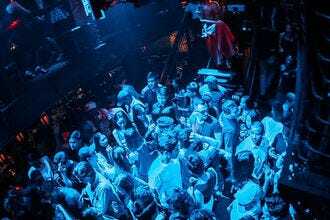 The Speakeasy, the latest addition to the Bangkok nightlife scene, is a classy upscale affair located up on the 24th and 25th floor of the recently opened boutique hotel The Muse. 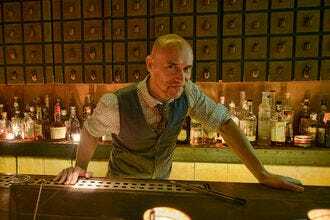 The theme of the bar is the Prohibition era 1920's in the U.S., and although you might be hard pressed to find any pistol packing gangsters here, there is plenty of nostalgic ambiance oozing out of the various niches that Speakeasy is made up of. Downstairs is a cozy Long Bar, along with the Blind Pig, a fancy cigar lounge full of varnished wood awaiting those in smoking jackets, while upstairs is the bar's most popular hangout, the Terrace Bar, overlooking the ritzy Lang Suan area and Bangkok's lit up night panorama. 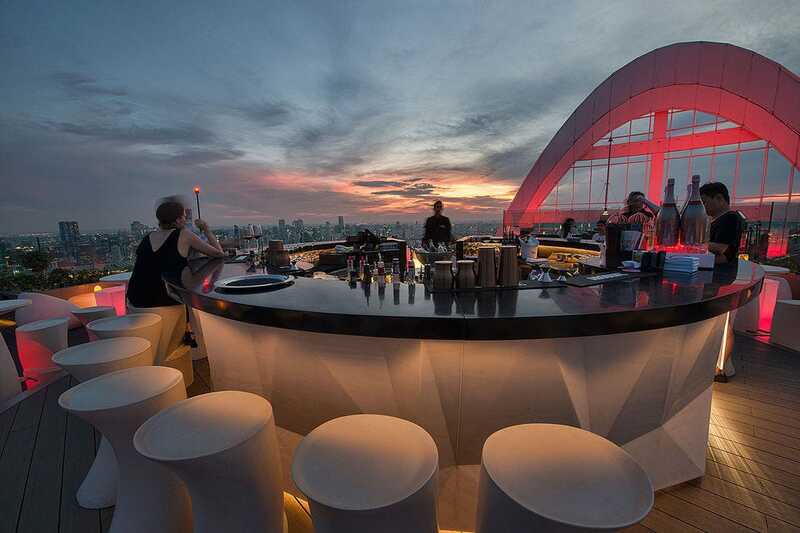 Overlooking the Chao Phraya River and the rest of the urban sprawl, Distil Bar (and the adjoining Sky Bar) are one of Bangkok's highest drink hangouts. Sip a Hangovertini, the drink made here during the filming of the Hollywood blockbuster film, indulge in fresh oysters or foie gras, take in some live jazz, or just gawk at the pretty people enjoying the dazzling views. Needless to say, sunsets up here are pretty popular, and come early, as it takes awhile for the elevators to make it up above the 60th floor. It doesn't get much better than this when trying to combine dazzling cityscapes, fine drinking, and suave nightlife venues. CRU Champagne Bar is a new elegant and elevated bar which is now the highest drinking spot in town. The Red Sky Bar several floors below it is nice enough, but you'll need to pop into the private elevator and head up another three flights to access this skyline gem. The bar has teamed up with GH Mumm and is the only place in Bangkok you can get their #1 edition pink champagne, or if you dare, a bottle of Bollinger James Bond 007 Spectre Limited Edition. You can toast to the heavens with this fine bubbly, or else opt for the cool signature drinks such as the Perfumed Lady, mixed with Beefeater gin, passion fruit, lime, mint, and vanilla foam, or a Bangkok Bellini, concocted with mandarin Absolut vodka, mango, ginger, and champagne. 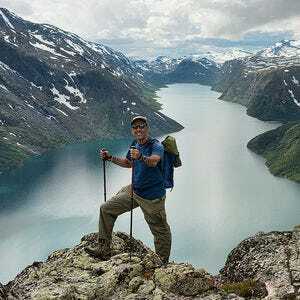 The views up here are beyond sublime, with all of Bangkok spread out in front of you on all sides. You can see the Golden Mount, the Grand Palace, the Chao Phraya River, all of downtown's major skyscrapers, and the nearby Baiyoke Tower II even looks on equal footing. Come here for sunset, sprawl out on the comfy seating, and if you get hungry, there are foie gras yakitori chicken skewers, caviar, cheese platters, and plenty of other snacks to get you through the transformation from day to night in Bangkok's most lofty drinking zone. Perched up on the 52nd floor of the Lebua State Tower, Lebua No. 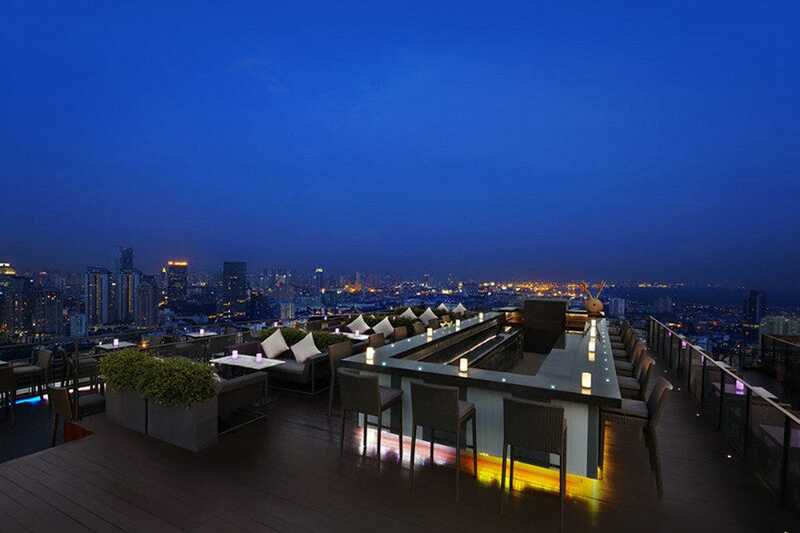 3 is the latest addition to the hotel's list of swank bars and restaurants with dazzling city views. 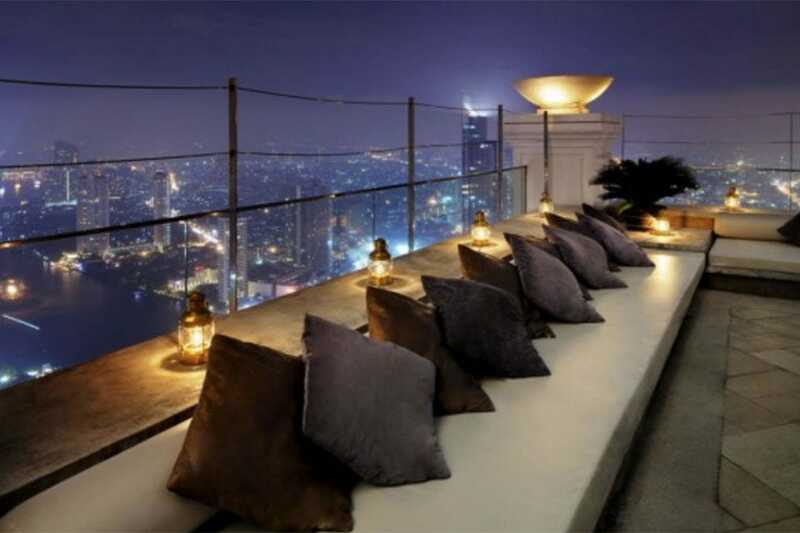 While Mezzaluna, the 2-star Michelin restaurant and the Sky Bar, famed for its "Hangovertini" cocktail, are already well known, Lebua No. 3 is set to become the talk of the town, as it combines the unique concept of three circular bars offering premium gin, vodka, and also caviar all under one roof, or should we say, above the roof, as a visit up here will put you on top of the city! One enters the bar here via a spiral staircase that leads into a marble-tiled entryway, where the letters Lebua No. 3 light up over the floor, surrounded by rather surreal haloed blue light. 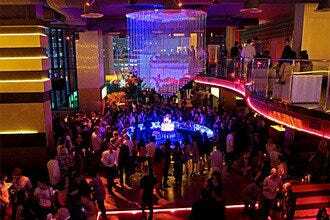 Further in, you get the first of the circular bars, this one serving up vodka and set inside under a roof, with glossy black finish highlighting the bar and its prime position opposite the DJ zone, where noted Ukranian DJ and producer Taly Shum spins tunes each night. From here, one heads out overlooking the city, with a caviar bar on one side, the gin bar just ahead, and a fancy digital retina display dance floor separating them, surrounded by comfy bespoke furniture. At the gin bar, many of the drinks here are made with the amazing premium Sipsmith London dry gin, which is featured in cocktail standouts like the Glamour, showcasing Sipsmith, Champagne Perrier Jouet, raspberry shrub, yuzu juice, and caviar air combined into one wild drink, or the Negroni No. 3, one of the most outstanding versions of this unique drink you'll ever have, using Mancino Rosso, Mancino Chinato, Campari, and a green tea ice sphere to go with the gin. Over at the vodka bar, Absolut Elyx, which is manually distilled in a copper still, and is exclusive to Thailand at Lebua, makes for some smooth pours. Try a Daniel Craig, made with Plymouth gin, Mancino Bianco, absinthe, and Absolut Elyx, or a Starry Night in Thailand, concocted with Absolut Elyx, Capucana cachaca, yuzu, ginger, and charcoal. While caviar might not be everyone's forte, the way it is served at the Lebua will make a lot of converts. The bar here has partnered up with the Caviar House of Bangkok, based in Hua Hin, to create a "caviar goes casual," scene, where Lebua No. 3 aims for an "affordable luxury for all" concept. Here, you get a serving of this superb local caviar plated on a Himalayan-salt spoon, which gets paired with a shot of vodka. Lebua No. 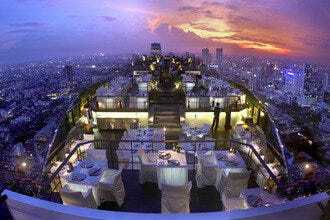 3 is the perfect venue to party, unwind, and see Bangkok at its most dazzling. It's elegant, contemporary, and exciting, combining fabulous mixology, premium alcohol and caviar, and happening parties alongside of the best view in town, and is certain to be another winner for the distinguished hotel group.